Millbrook, N.Y. – Tickets go on sale Wednesday, August 8th for the Inaugural Hudson Valley Chefs Challenge taking place Saturday, September 15, from 12-4 pm at Millbrook Vineyards & Winery. Planning partners, Dutchess Tourism Inc., Cornell Cooperative Extension Dutchess County, and the Dutchess County Sheep and Wool Growers Association are organizing the event along with challenge sponsors Millbrook Vineyards and Winery and The Valley Table. The first annual chefs challenge will feature lamb as the main ingredient. Fifteen top chefs from the Hudson Valley will compete for Best Overall Lamb Dish ($750 prize), Best Use of Hudson Valley Products ($500 prize) and the Most Hudson Valley Products Used in a Dish ($250 prize). The top three chefs will also receive a unique porcelain trophy sponsored by Lenox. Ticket holders will have an opportunity to sample the lamb dishes as well as taste area wines, craft brews and locally distilled spirits. The challenge will be conducted by presenting a tasting menu format, so recipes will be divided into appetizer-sized portions. All dishes will be judged by a panel of selected experts/chefs and by VIP ticket holders. VIP tickets are $75 and include a complementary wine glass, food and drink tasting and voting privileges, which take place from 12-2 pm. General admission tickets are $35 and include a complementary wine glass, and food tasting opportunity from 2-4 pm. Wine and spirit tasting is not included in general admission ticket price, and craft beverages will be sold by the glass. Awards ceremony will begin by 3:30 pm. Millbrook Vineyards and Winery is located at 26 Wing Road in Millbrook and directions can be found on their website www.millbrookwine.com. 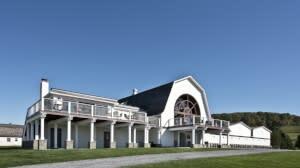 Called “the Hudson Valley’s flagship winery” by The New York Times and “a great place to visit” by The Wall Street Journal, the winery is a wonderful place to visit any time of year for a memorable tour and wine tasting. Dutchess Tourism, Inc. is the officially designated destination marketing organization for Dutchess County and is accredited by the Destination Marketing Accreditation Program (DMAP) of Destinations International. It is an independent 501c6 non-profit organization that works to bring tourism dollars to area businesses by marketing and promoting the assets of Dutchess County to the nation and the world.